Groen has made a giant leap in the braising pan & steam kettle category. From its precision and accuracy to its top-tier water-resistance feature, this technology is taking the braising pan and steam kettle game to the next level. The need to hover around your equipment and constantly monitor your food product has been a norm in this industry for far too long. Think about the hectic environment in a kitchen during high-volume hours of operation - it's a mad house! Odds are mistakes get made and certain tasks get lost in the back of your mind while you're trying to juggle 19 things at once. Groen has alleviated that problem with their new controller technology. Want to see the Groen Braising Pan & Steam Kettle in-action?? Watch an episode from our friends on Chef Adam Live from the Unified Brands test kitchen! This latest evolution in the braising pan and steam kettle technology truly gives the chefs control of their equipment. The ability to cook on a low setting or high setting (a.k.a. "rock and roll" as Unified Brands Corporate Chef, Chef Steve D'Angelo, likes to call it) at the single press of a button. Giving you the most precise temperature you desire between 175° - 425° with a timer gives peace of mind to the kitchen staff by freeing up that headspace to carry out the various other tasks needed to keep the kitchen running smoothly during its busiest hours. The control panel is IPX6 water-rated, so even the most threatening element of electricity can't slow this equipment down. No longer do you need to be chained to your equipment making sure it's doing exactly what it should be doing. 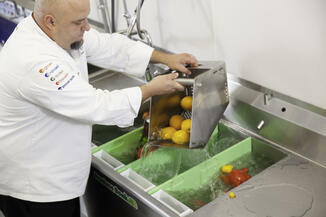 Groen has created the most innovative solution for the most versatile piece of equipment in the kitchen. And if it's any indication on where the future of braising pans and steam kettles for this company we are extremely excited for what's in store! This may have a little less to do with automation and more to do with awesome tech innovations, but it is definitely worth talking about. Unified Brands' efforts don't stop at the equipment itself. Purchasing this expensive kitchen equipment is a huge commitment and it's difficult for operators to visualize it in their space. That's what led Unified Brands to develop their augmented reality application. The A.R. technology gives the user 360° views of 3D renderings in conjunction with the devices camera to bring the equipment to life right in their kitchen. When we think of efficiency, the first thought that may come to mind is time-consuming. Doing the job right, and doing it well, usually means taking no shortcuts. These types of tasks can be tedious and daunting, but they have to be done. Unified Brands and their ware and produce washing equipment, Power Soak and Power Prep, have given a new meaning to efficiency with their "continuous motion" technology. Cleaning dishes is a dirty job, but someone has to do it. Power Soak creates an environment in which the ware is continuously rotating and moving freely thanks to a precise parallel wash flow system. This ensures every spec of the ware's surface is getting exposed and maximizes the clean. All the operator is required to do is load it up and watch the magic happen. But, it doesn't stop there. The folks at Unified Brands took it a step further. Not only does the continuous motion technology enhance efficiencies in the dish department, but has been transformed into a food prep station! Power Prep takes that free-flowing circulation to make sure your produce is fully-immersed and rid of debris, bacteria and any harmful contaminates. This helps improve food safety in your kitchen and increases the shelf life of your produce - we like to call that a "double-whammy!" Parlay these benefits with game-changing automation of Sally the Salad Robot and we're looking at the future of the foodservice industry. Unified Brands has taken some of the most time-consuming and inefficient tasks in the kitchen and brought them into the technological age. Automation doesn't need to solely exist within one piece of equipment; it can be a process. Multiple pieces of equipment give you the ability to create consistent, high quality food with very little skill level. As a leading innovator in the foodservice industry, Alto-Shaam is continuously developing new solutions to make life in the kitchen as efficient as possible with their line of equipment. Take a look at how we utilized the probe function on an Alto-Shaam Cook & Hold to perfectly cook a steak burger to the correct internal temp. We then used the programability and speed of the all-new Vector® Multi-Cook Oven to finish the burger off in two minutes. Although this isn't a fully automated system, these automated components make the process efficient and the quality of the food consistent. 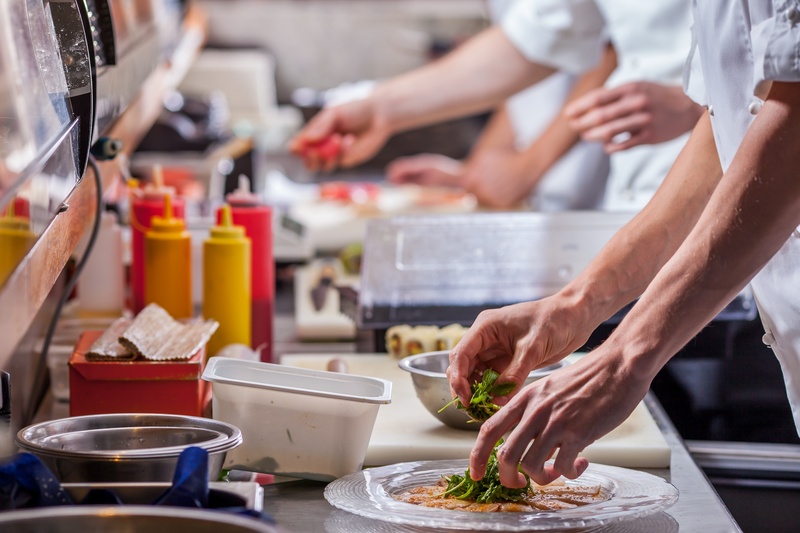 Probed cooking has taken on the role of entry-level automation with its set-it-and-forget-it capabilities and the consistency it brings to your food. Automation in the kitchen is quickly becoming the standard in the commercial foodservice industry. As the landscape of our industry continues to change, your number one concern as an operator is being able to deliver a consistent and quality offering. Don't get stuck in the old ways of doing things. Take your processes to the next level with automated technology solutions.